You are at:Home»Mike Young's Blog»Has 400m Training Changed? “I didn’t do it to save a few dollars, to start off with,” Wariner said. “I did it because I felt like it was time for a change. Coach Ford, my new coach, has the same philosophy as coach Hart. My workouts are exactly the same.”Not true, said Darold Williamson, Wariner’s training partner and a former teammate at Baylor who also cut ties with Hart and hired Ford as his personal coach. Williamson said Ford’s regimen calls for more sprint work- regular intervals at 100 and 150 meters- which is something Wariner wanted in 2007 despite Hart’s protestations. Wariner continues to toy with the idea of one day competing in the 200 and 400, just like Johnson did. Hart wanted Wariner to focus exclusively on the 400, and the dynamic between pupil and teacher changed. Though Williamson said he has not talked to Wariner in detail about the coaching change, he said Ford is less rigid than Hart and open to change. I’m not agreeing or disagreeing….just thought it would make interesting food for thought and forum discussion. 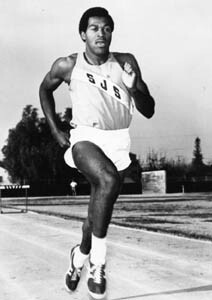 In 1968, Lee Evans was the 400m Olympic Champ with a winning time of 43.86.